This Fort Lauderdale fishing charter report has a few more bright spots but there continue to be a few bumps in the road. Once again another front is moving down on us and once again our hopes are up for the Sails. On our last report we said we were ready , and well, we still are. Now we have seen a few, but 60 miles above us and 30 miles below us was (were) the place to be for that last front. So here comes another ?cold’ snap and as we said, we are ready / locked and loaded / for a push of Sails. So as for the sails we caught them in 300 to 550 (deep for them typically)) and a really big one in 45 feet on a rip that looked too good to pass up. We see them in way there for sure, often chasing bait, but there wasn’t really any bait showing but we hit it just the same what with the edge and clean water. It isn’t the ?norm? here. Charter us 6 or more hours and we’ll offer you the option of live baiting Ballyhoo on 20# spin. Time tested and proven old school fun and gun. We have had some nice Mahi-Mahi hit the box and the majority of these have moved off the reefs and our areas have been 250 to 600 feet which isn’t really a very broad area to cover here with our drop off especially with a spread of live ballyhoo which allows us to move freely. Reasonable sized fish with almost all being ?gaffers?. Singles, pairs or up to say 4 or 5 in a school. Small bunches for sure and often very cautiously temperamental with the big moon, but we have been able to get most to bite as they are staying in the bait pattern even when hesitant and allowing us to pitch something else in front of them, often more than once, to get them to eat. Curiosity killed the cat rings true on them lately. Snapper fishing has been very good, especially since we are doing quite a bit of it with the slow Sailfishing…. ?…Actually it has been quite good for them. Vermillions are best and as usual on structure in deeper water. 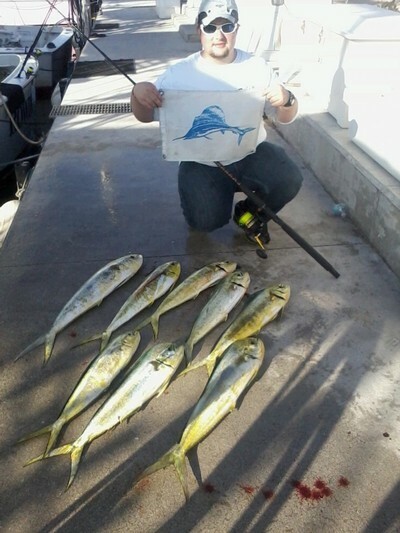 Some Jacks on the wrecks on live bait. Kings are tough right now but there are some Wahoo with that big moon.